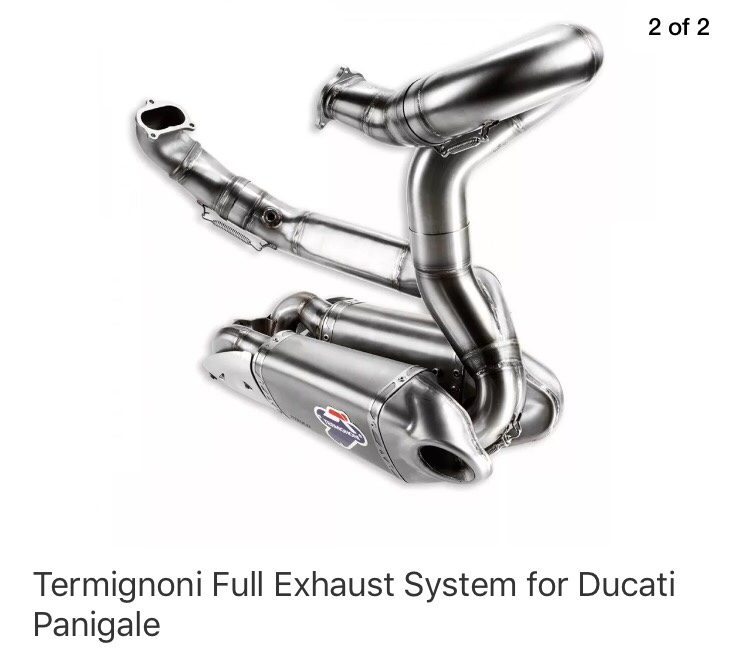 Can anyone give me their opinion on this full system for a panigale 1199 ? Is it too loud without db killer? Any negative sides? Or Any issues? Are the performance improvements noticeable? Straight from the Ducati Corse department for the World Superstock Championship, the Ducati 1199 Panigale Termignoni full exhaust system features stainless steel manifolds (70mm) and titanium sleeves on the silencers with removable db killers. Max power increase is 5%, weight reduction around 4.4 lbs (2kg). Note: This system will bolt on to all 899-959-1199-1299 Panigales, however it only includes the ECU map for 1199 Models." Termi is a bit old hat to be fair........ ever since ze Germans took over. But that Termi doesn't state the pipes are in Titanium? Only the sleves on the cans. Sounds like they are wording it so you think you are getting a full Titanium system. Why that when you can this? Personally, I would go for the Akra. I have had both in my hands and had both on my bikes. The Akra always seemed better in quality, aesthetics and sound. Yes I agree but I can get Termignoni for a great deal half the price.. will it be worth? Isn't bluff the 5% power increase? If price was the deciding factor I would put 1299 OEM headers on it and aftermarket slip ons. If it's not titanium headers your buying I would go the larger OEM 1299 and save a packet, someone on here would probably sell you headers for about $300.